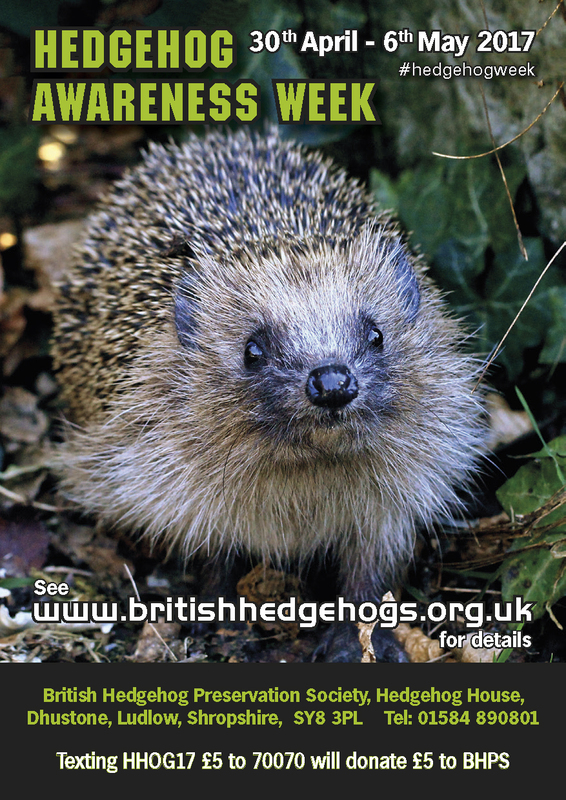 Hedgehog Awareness Week is organised by the British Hedgehog Preservation Society (BHPS) and takes place every year. 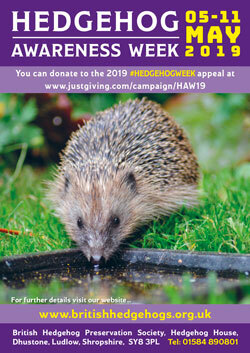 It aims to highlight the problems hedgehogs face and how you can help them. 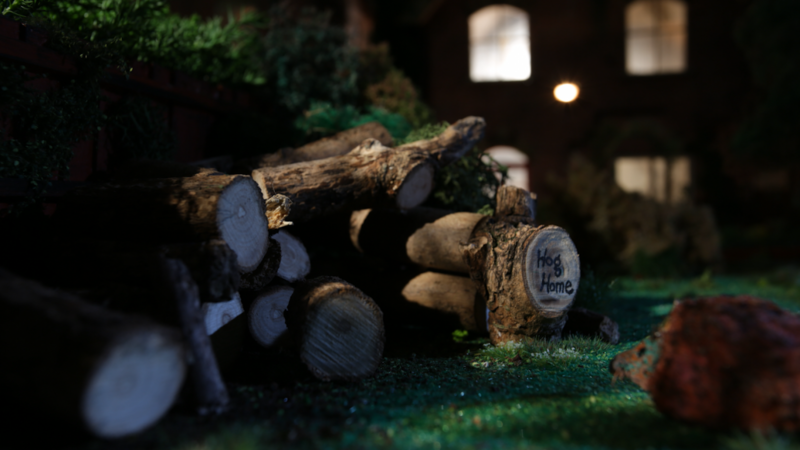 This year the Charity is asking people to make a space for hedgehogs to live in their garden, this could be in the form of a log pile or wild area (that will also provide a buffet of creepy crawlies) or a more formal hedgehog home. 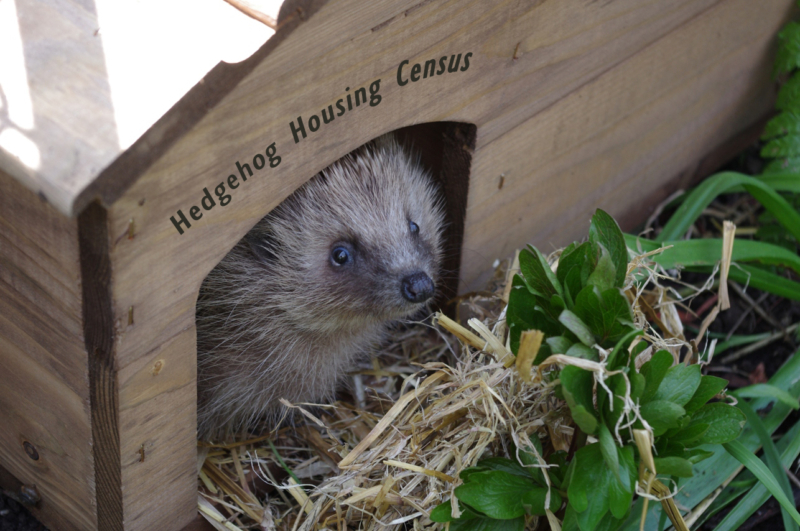 The Society has a free downloadable plan for building a hedgehog home on their website (www.britishhedgehogs.org.uk/hedgehog-homes). Make sure there are CD case sized gaps in boundary fences and walls to allow easy passage. Move piles of rubbish to a new site before burning it. Check areas carefully before mowing or strimming. Ensure there is an easy route out of ponds & pools. 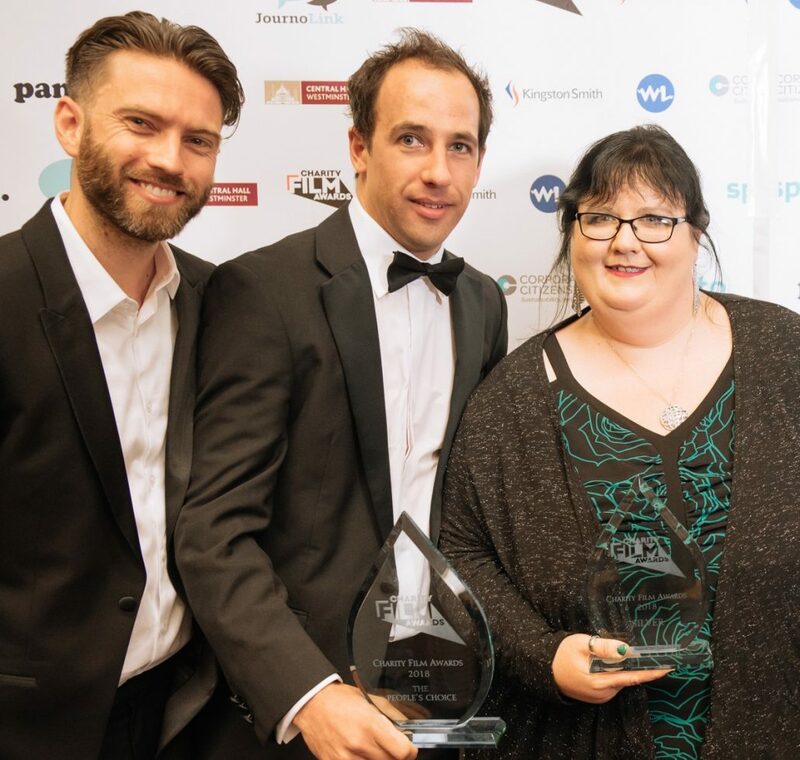 The British Hedgehog Preservation Society (BHPS) is delighted to have scooped prestigious accolades at the Charity Film Awards held in London on 11th May. 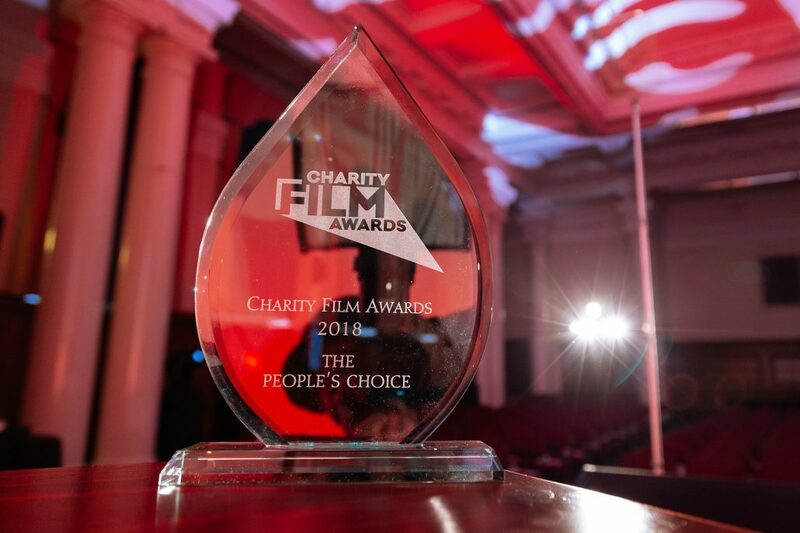 Their Hedgehog Close film held off fierce competition to be placed silver in their category and honoured with the overall People’s Choice Award. 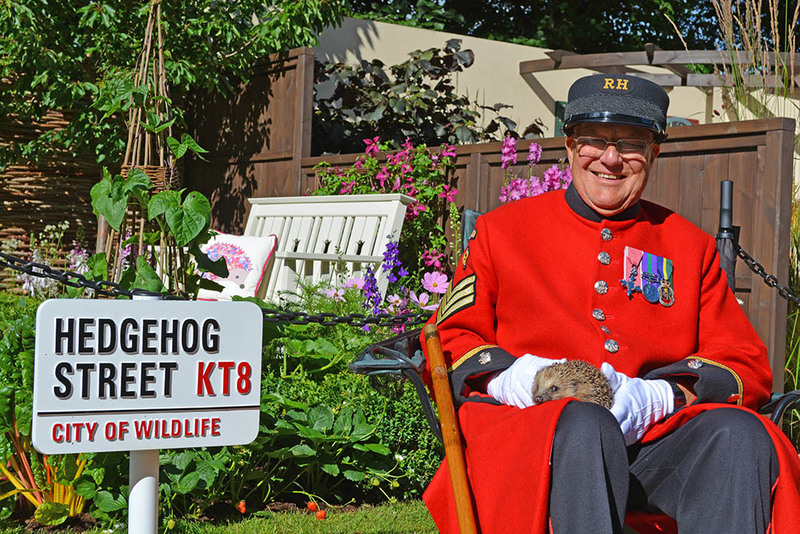 Hedgehog Close was created to spread the word about how to help hedgehogs and make people aware of their plight. Voiced by Gordon Buchanan and created by Zest Productions, the ‘Aardman-esque’ film has been widely shared on social media and viewed by well over a million people to date. 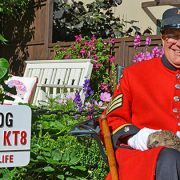 The Charity hope this will boost the popularity of the film even more resulting in more people finding out all about our humble hedgehog. Hedgehog Close can be viewed below. 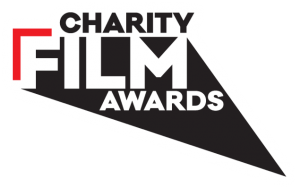 Please vote for “Hedgehog Close” in the 2018 Charity Film Awards! 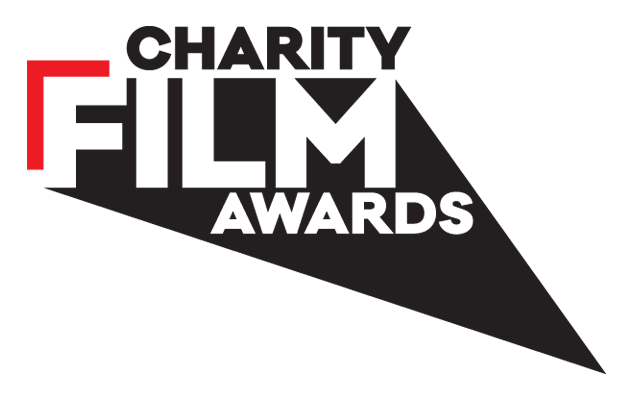 We are thrilled to announce that our charming short film has been nominated, but now we really need your help as we enter the public vote stage! The two minute film was released on social media during ‘Hedgehog Week’ and swiftly shared by BBC Springwatch as well as a host of other major charities and organisations. To date, the film has gathered well in excess of 600,000 views on Facebook as well as a huge amount of positive audience interaction and shares. The aim throughout was to create something engaging and charming but with a strong message embedded. Achieving the right tone was crucial, and the voiceover from BBC’s Gordon Buchanan was an important ingredient in setting the right mood and feel. From the outset, we wanted the film to also engage a younger audience and we were delighted about how well it went down with children and parents alike. The film has been screened in a number of schools and is now being sent out within educational packs. The film was also featured on The Daily Telegraph website and endorsed by the likes of Aardman Animations guru Peter Lord CBE. 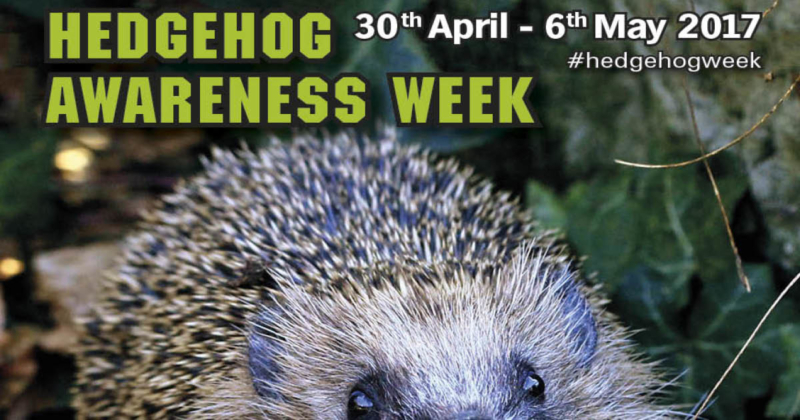 https://www.britishhedgehogs.org.uk/wp-content/uploads/2017/08/header.jpg 0 0 andy https://www.britishhedgehogs.org.uk/wp-content/uploads/2017/08/header.jpg andy2017-11-01 09:34:442018-05-16 15:02:28Vote for “Hedgehog Close” in the 2018 Charity Film Awards! Ensure there is hedgehog access in your garden – a 13cm x 13cm gap in boundary fences and walls. Organise an event such as a cake sale, fun day, sponsored event, coffee morning or jumble sale. ]Display information (BHPS can provide) in your work place or local Garden Centre, School, Library, shop, etc. 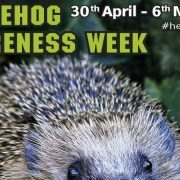 Contact your local newspaper or radio station a few weeks before Hedgehog Awareness Week and ask them to help hedgehogs by printing a letter from BHPS (we can provide a letter to the editor on request) or by arranging an interview with us during the week (ask them to call 01584 890 801 to book a slot). Post leaflets in your area letting people know how they can help hedgehogs (BHPS can provide leaflets). If you are organising an event, PLEASE let BHPS know as soon as possible so that we can keep a comprehensive list of events across the country. We often get calls from the media and public asking for local events and if we don’t know about your event we can’t point them in your direction. We are hoping to raise £2,000 during Hedgehog Awareness Week 2017, texting HHOG17 £5 to 70070 will donate £5 to this appeal. (You can change amount to £1, £2, £3, £4, or £10 to donate those amounts). Leaflets and posters are available on our website or we can post copies out on request. Twiggy sparks bonfire night hedgehog checks! 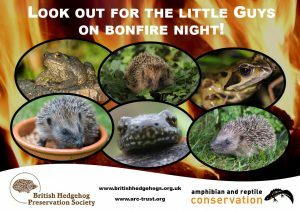 With bonfire night and Halloween fast approaching, the British Hedgehog Preservation Society (BHPS) and its Patron Twiggy are urging people to build bonfires on the day they are to be lit to save hedgehogs and other wildlife from appalling suffering. This will not only save wildlife from burning to death but will also stop the bonfire from getting soaked should it rain the night before! Fay Vass, Chief Executive of BHPS, said “If material is stored on open ground in advance of having a bonfire, it’s crucial to dismantle it and move it to another spot just before lighting. Ensure it’s moved to clear ground – never on top of a pile of leaves as there could be a hedgehog underneath, and not too close to pampas grass which can ignite very easily and is another favourite spot for hedgehogs to hide under.” If a large bonfire must be built in advance, protect it whilst building by putting some chicken wire, at least one-metre-high, all the way around the bottom. This should be held in place with stakes and the wire should slope outwards at an angle to make it difficult to climb, as hedgehogs are good climbers! In case you have missed anything light the fire from one side only and keep people away from the unlit side so that any hedgehogs can hopefully escape in peace. If, whilst building, a bonfire is left unattended, for however short a time, it’s imperative to check for young children, hedgehogs and other animals, including family pets, before lighting. 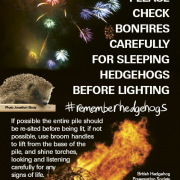 As hedgehogs tend to hide in the centre and bottom two feet of the bonfire, check by gently lifting the bonfire section by section with a pole or broom. Never use a spade or fork as these can stab them. Using a torch will help to see and listen for a hissing sound, as this is the noise they make when disturbed. Fay continues “If hedgehogs are found, take as much of the nest as you can and place them in a high-sided cardboard or plastic box with plenty of newspaper/old towelling. Ensure there are air holes in the lid and that the lid is secured firmly to the box, as hedgehogs are great climbers. 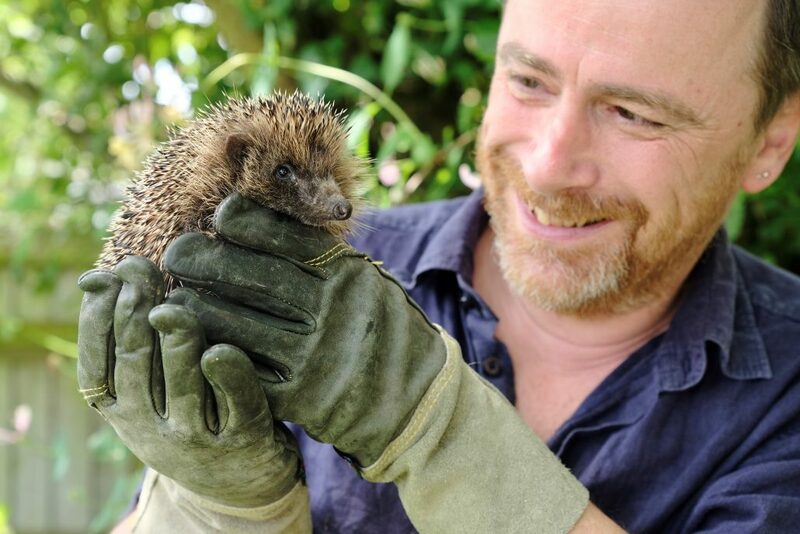 Wear garden gloves so as not to get human smells on them and to keep them calm as hedgehogs are easily stressed – also, it protects your hands from their spikes. Put the box in a safe quiet place such as a shed or garage well away from the festivities, offer specialist hedgehog food, meaty cat or dog food and water. 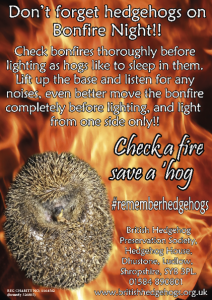 Once the bonfire is totally dampened down, release the hedgehog under a hedge, bush or behind a stack of logs.” Twiggy added “Hedgehogs are in decline and it’s so important that we do all we can to help them. 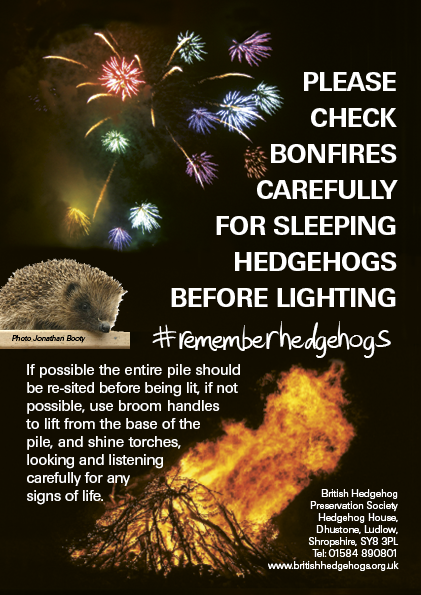 Please check carefully and remove hedgehogs or other wildlife before setting fire to any bonfire piles. 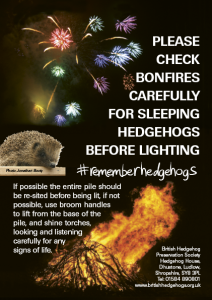 Have fun, but stay safe and keep our wildlife safe too.” Going to an official organised fireworks display is a far safer option for both humans and animals! For free advice and information on hedgehogs, contact the BHPS on 01584 890 801. – – – – – – – – – – – – – – – – – – – – – – – – – – – – – – – – – – – – – – – – – – – – – – – – – – – – – – – – – – – – – – – – – – – – – – – – – – – – – – – NOTES: • For pictures, further comment or interviews with Fay Vass, Chief Executive of BHPS, please call 01584 890801 • By giving out the above information prior to Halloween and Bonfire weekend, it will hopefully stop people from building their bonfires in advance, thus saving many hedgehogs from horrific suffering. Many thanks. • If you would prefer to save paper and receive future press releases by email, please email info@britishhedgehogs.org.uk and ask to be added to email press list. Please click on the images below to view/download a copy of the bonfire night posters. 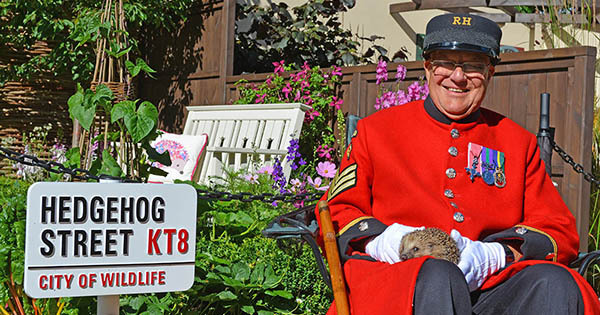 https://www.britishhedgehogs.org.uk/wp-content/uploads/2017/08/header.jpg 0 0 andy https://www.britishhedgehogs.org.uk/wp-content/uploads/2017/08/header.jpg andy2016-10-27 15:40:282016-10-28 12:56:41Twiggy sparks bonfire night hedgehog checks!